National Geographic – Why Is the Cold U.S. Winter Killing Off Stinkbugs? Although the polar vortex this year has been responsible for dumping record amounts of snow and pumping bitter cold across the nation, it is also helping to kill off the invasive brown marmoted stinkbug from Asia. 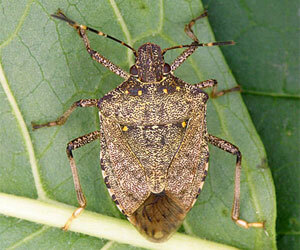 Most likely brought over on an Asian shipping container in the 1990’s, the stinkbug has been destroying crops across the U.S. and has few natural predators. The clever bug likes to spend its winters in warmer attics, activating an anti-freeze like fluid to keep it from freezing to death, but the bugs caught outside are dropping dead in record numbers. “In the previous two years, natural mortality averaged about 20-25 percent,” he wrote in an email. In January 2014, however, Kuhar’s team discovered that the subfreezing temperatures had killed off 95 percent of a small test population of stinkbugs. “I wouldn’t say mass die-offs, but temperatures probably reached lethal levels for many insects,” said Kuhar. What will the weather be like for Raven’s Playoff game Sunday?